Chef Jeff Michaud (left) in the kitchen at Osteria on North Broad Street, November 29, 2017. Chef Jeff Michaud, backed by restaurateur Michael Schulson, is buying Osteria, the destination Italian restaurant that he helped to open just over a decade ago, from Urban Outfitters. In doing so, Michaud will leave Urban, the Philadelphia retail giant, where he is executive chef and culinary director. Osteria was one of several Vetri restaurants that Urban bought in late 2015 from founders Marc Vetri and Jeff Benjamin, who resigned last year. The men still own and operate the flagship Vetri Cucina at 1312 Spruce St.
As part of the quadrumvirate that propelled the Vetri empire into a brand name over the last decade, Michaud said his new role at Osteria — effective Feb. 1 — "feels like going home." As Osteria's owner and executive chef, he said he would redouble his efforts. "Corporate life isn't for everyone," Vetri said in a brief chat Wednesday. 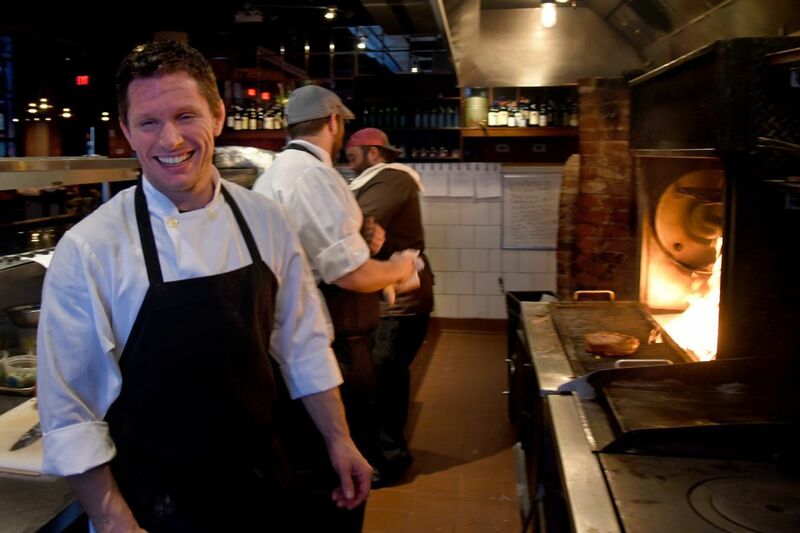 Michaud, 40, a New Hampshire-reared Culinary Institute of America grad, was opening chef at Osteria, at 640 N. Broad St., in 2007 — the first of the Vetri offshoots and the fanciest of the lot. Osteria won a James Beard nomination for best new restaurant that year, and in 2010, Michaud won the Beard for best chef in the Mid-Atlantic region. In 2013, his cookbook Eating Italy: A Culinary Adventure — based on his immersion in Italian cuisine while meeting his Italian-born wife, Claudia — was released. The same year, an Osteria branch opened at the Moorestown Mall; it closed two years later. Chef Brad Spence — the fourth key player in Vetri's growth — remains with Urban, which owns Pizzeria Vetri, Amis, Bar Amis, and Alla Spina. Spence said he planned to stay with Urban, for which he has opened Amis in Westport, Conn., and plans to open another location in Devon. "I'm constantly learning," he said. In a statement, Urban chief development officer David Ziel praised Michaud as "an incredibly dedicated partner" and said he looked forward to working with him in the future. Schulson, 44, has been on a hot streak of late. His Schulson Collective, which he operates with his wife, Nina, includes Sampan and its Graffiti Bar, Double Knot, Harp & Crown, and the seasonal Independence Beer Garden in Philadelphia; Izakaya at the Borgata Casino in Atlantic City; and Monkitail in Hollywood, Fla., as well as a catering division. Schulson and the South Philadelphia Termini baking family are building Giuseppe & Sons, an Italian restaurant, next to Harp & Crown, on the 1500 block of Sansom Street. Vetri, 51, and Benjamin, 49, plan to open a second Vetri restaurant, at the Palms Casino in Las Vegas. Vetri is completing a cookbook, Mastering Pizza, and Benjamin has signed on to oversee Fitler Social Club, a high-end private membership club expected to open in 2019 at 2400 Market St.